Last weekend some of my fellow AVODAH alumns hosted an afternoon of bartering. Everyone brought home made products, ranging from hummus to fresh juice to calligraphy to mix CD’s. It was super satisfying because although I arrived having put minimal effort into making a few things, I left with a bounty: pickled okra, a beautiful necklace, bright purple ABC juice (apples/beets/carrots), fig preserves and soft pretzels for my non VGF sweetheart. 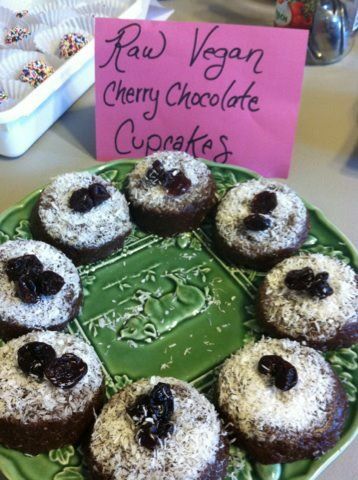 My offering to the bartering table was pickled carrots (I pretty much just made up the recipe as I went along) and raw vegan cherry chocolate cupcakes. These were inspired by this wonderful recipe from For the Love of Food. I followed the recipe to a T, using macademia nuts and cashews for the allotted amount of nuts, and the addition of some dried cherries. I found that this made them very oily, but still delicious and extremely rich. I incorporated the fig preserves into an original ice cream recipe that I really should feature in a future post: vanilla fig cardamom custard. The base was a cashew cream, which made the whole things more rich and creamy than any vegan ice cream I have ever made at home. Yum!